I love the blog Beguiling Hollywood. Vickie Lester posts these great pictures of stars of yore–publicity shots, movie stills–and describes them with a quick caption or a little essay and they’re always good. Today’s was a still from the film noir classic Double Indemnity. Barbara Stanwyck (in shades) and Fred MacMurray in a supermarket on Los Feliz. 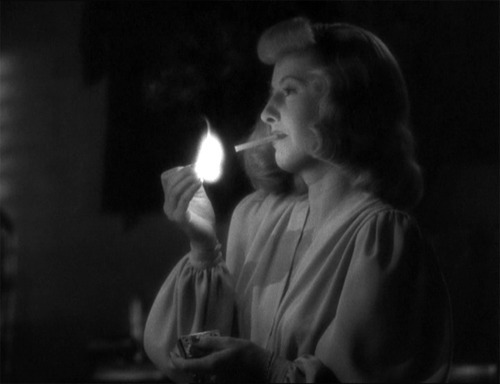 She’s Phyllis Dietrichson, the murderess. He’s Walter Neff, the insurance salesman gone bad, a murderer. Walter sets the scene for us. …but we couldn’t be seen together any more and I had told her never to call me from her house and never to call me at my office. So we had picked out a big market on Los Feliz. She was to be there buying stuff every day about eleven o’clock, and I could run into her there. Kind of accidentally on purpose. Now, setting aside the fact that Barbara Stanwyck had been wearing nothing but a towel in her opening scene (the Hays Commission complained it was skimpy), let’s talk about that market. Assuming it was based on an actual place, and I believe screenwriter Raymond Chandler’s locales usually were, this would have been some place in Atwater Village, I’m sure. Los Feliz Blvd is pretty much old residences the entire stretch except for the south side of the downward slope as it comes up on Riverside, which is all apartments now, an unlikely location for a market. Therefore it would have to be on Los Feliz Blvd itself. It might have been. But Beach’s Market, a big market (the script calls for a supermarket), was on Glendale Blvd at Glenhurst, not on Los Feliz. That’s just across the river (and freeway) from us. It was still new in 1939, and the old Red Car trolley ran down Glendale Blvd. People living in our very place probably walked down to the station at the end of our street, hopped the Red Car to Beach’s and back, buying the booze and wine that stains our wood floors half a century later. We like to think they were screen writers or starlets (well, I do.) The cigarette burns on the floor imply a certain amount of wantonness, anyway. The Red Car was gone by 1955. Beach’s (done in by earthquake and competition) was gone by the early nineties. For years the location remained an empty lot, a pumpkin patch in the fall and christmas trees in the winter. Several years ago one of those as un-art-deco-as-possible mini-malls went in, and an ugly thing it is. Gaudy, tacky, shiny, suburban. But there’s a pretty good (and way cheap) Salvadoran place about where Walter Neff would have parked his 1938 Dodge coupe, and Phyllis her La Salle or the Plymouth. I know this because I obsessively found a photograph of Beach’s Market. In fact I just wasted a good chunk of the morning researching all of this, working at my desk in the living room where once starlets canoodled with assistant directors. And of course I’m assuming there was no big market on Los Feliz. That’s a big if. In the novel, James M. Cain (who also wrote The Postman Always Rings Twice) didn’t bother with a market at all. He had them meet instead in Griffith Park, two hundred yards up Riverside Drive, near Los Feliz Blvd Don’t park on Los Feliz, Neff says. The pony ride is there now. It wasn’t when Cain wrote the novel. But it was brand new when the script was being written a couple years later. Maybe they switched the scene to a supermarket because a no good dame and a pony ride don’t go together. Maybe they just liked the idea of a no good dame and her sucker of a boyfriend surrounded by canned goods. Stepping out of the story and into reality, however, the scene was shot at Jerry’s Market on Melrose Ave. It, like Beach’s, is long gone, though instead of a mini-mall there’s a film studio now. I suppose that’s ironic, sort of. This is the problem with living in the neighborhood in which a classic movie takes place. You begin obsessing over where these entirely fictional scenes take place. It’s one thing if they’re location shots, like Walter’s apartment building on Kingsley (still there) or Newman’s Drugs at Hollywood and Western where later Hollywood Billiards stood (and talk about real life film noir…), there’s a store there now, something much more innocent. Phyllis’s place was up Beachwood Canyon, the stairwell she strode down in that honey of an anklet was in a soundstage but modeled after the interior of that house. But when they’re backlot it’s pretty absurd obsessing over them like this. Just a few days ago we were at the House of Pies on the southwest corner and I looked across the street and didn’t see Nino Zachetti and felt a little relieved. The guy was a punk. But that scene wasn’t shot anywhere near there. Maybe this is how those hippies who move to New Zealand to hang with the hobbits start. I had a friend who met a stoner in Humboldt County who said he’d met Bilbo Baggins at a séance. My pal didn’t have the heart to tell him that Bilbo Baggins was a fictional character. But I’m not that far gone net. Though half of Hollywood might be. Incidentally, James M. Cain based his Double Indemnity on a real story, a sensational 1920’s murder with a lady enlisting a lover to get rid of her husband. It was grisly and appalling. She was caught, sentenced to death and electrocuted at Sing Sing. A photographer snuck in a camera and snapped a picture as the current ran through her body. You can see, almost feel, the thousands of volts, her body a blur of movement. The next day the New York Daily News splashed it across the front page beneath the one word headline “DEAD!” Murder is so much more fun in the movies. Stylish even. We stare at Barbara Stanwyck’s legs as she talks of killing her husband. Walter cracks wise, a tough guy. She purrs, deadly. The murder is quick, surprisingly easy. A nice clean job of it. They dump the body on the railroad–near the Glendale railroad station about a mile or so from here–and get on with the cycle of self destruction. We never see the execution. Walter, Edward G. Robinson says, you’re all washed up. I love you too, Neff says. Speaking of love, Ruth Snyder received 164 marriage proposals on death row. Not even Billy Wilder could turn that into a movie.